Thinking it's time to get a head start on Christmas shopping? Visit the Nottawasaga Resort for the 36th Annual Sugar Plum Fair Craft Show, on Saturday November 9th and Sunday November 10th and discover a spectacular line-up of crafters who feature a unique line-up of handmade items. Whether you're a return or first time visitor you will experience a treat at this year's show. We're excited to welcome back some incredible vendors and introduce a line-up of new and talented crafters who will be displaying their creations during the two day show. The show features over 100 vendors from across Ontario selling a variety of items including chocolate, jam, fudge, sauces, quilts, candles, ceramics, stained glass, wreaths, folk art, woodwork, children's toys, body care products, pewter, Christmas decorations and more! All the items are handcrafted by the crafters themselves. Santa will also be stopping by on both days so don't forget to bring your camera. 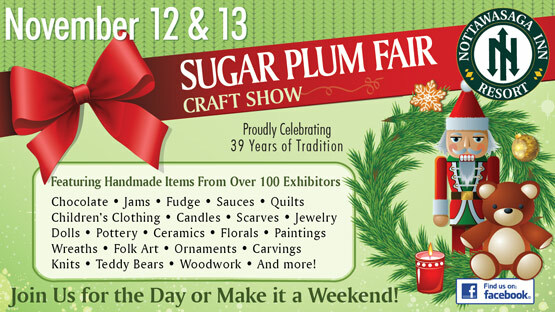 The Sugar Plum Fair, which takes place in the 21,000 sq.ft. Resort Trade Centre, is fully wheelchair accessible and offers a concession available for snacks or lunch. Santa's Visit: Santa will also be stopping by on both days from 1:30pm to 3:30pm so don't forget to bring your camera! Visitor Tip for Strollers: The mornings can be quite busy at the Sugar Plum Fair and a challenge to manoeuvre for those with strollers. Crowds tend to be smaller in the afternoon after 1 or 2pm on Saturday and after 12pm on Sunday if you prefer a little more room. Please consider leaving the stroller at home or visiting after these times, however you are welcome to attend at any time as we love having the whole family visit. Our concern is the enjoyment of the show for all our guests. Visitor Tip for Accessibility: The Trade Centre is wheelchair accessible. Please enter through the Sports & Leisure Dome entrance to access the elevator. Vendors: If you are interested in receiving an application for the 2019 show please contact the marketing department. A full list of vendors participating in the 2018 show is available here. To view photos from last year's show please visit our flickr album.